The latest monthly QV House Price Index shows nationwide residential property values for June increased 8.1% over the past year which is the slowest annual rate since March 2015. Values rose by 1.2% over the past three months and the nationwide average value is now $639,051 which is 54.2% above the previous market peak of late 2007. When adjusted for inflation the nationwide annual increase drops slightly to 5.9% and values are now 28.8% above the 2007 peak. Residential property values across the Auckland Region increased 7.2% year on year which is the slowest annual rate of growth seen since September 2012. Quarterly value growth has plateaued at 0.0% over the past three months. The average value for the Auckland Region is now $1,045,059 and values are now on average 91.2% higher than the previous peak of 2007. When adjusted for inflation values rose 4.9% over the past year and are 59.6% above the 2007 peak. Values across the Auckland Region are continuing to plateau with values remaining steady over at 0.0% change over the past three months. Values have continued to rise in some parts of the Auckland region but have decreased in others. Auckland City – Islands rose the most over the past quarter with values rising 3.1% since April and 13.3% year on year. Rodney-North also continued to increase more quickly than other parts of the city up 2.2% over the past three months and 13.6% year on year. Values decreased in the Auckland City apartment market and also Auckland City East and South; as well as in Waitakere, Manukau-North West, Papakura and Franklin over the past three months. Hamilton City home values are rising again up by 1.2% over the past three months and 9.5% year on year. Values are now 49.2% higher than the previous peak of 2007. The average value in the Hamilton is now $539,357. “There are a good number of low-mid homes currently on the market in the lower price bracket of between $350K and $500K which is giving first home buyers a better chance to get into the market. Tauranga home values have increased by 14.6% year on year and 1.6% over the past three months. Values there are now 42.8% higher than the previous peak of 2007. The average value in the city is $687,364. Meanwhile, Western Bay of Plenty values have increased 16.3% year on year and 3.7% over the past three months. The average value in the district is now $612,363. QV homevalue Tauranga, Registered Valuer, David Hume said, “Demand for Mount Maunganui based properties remains strong and record prices continue to be achieved. 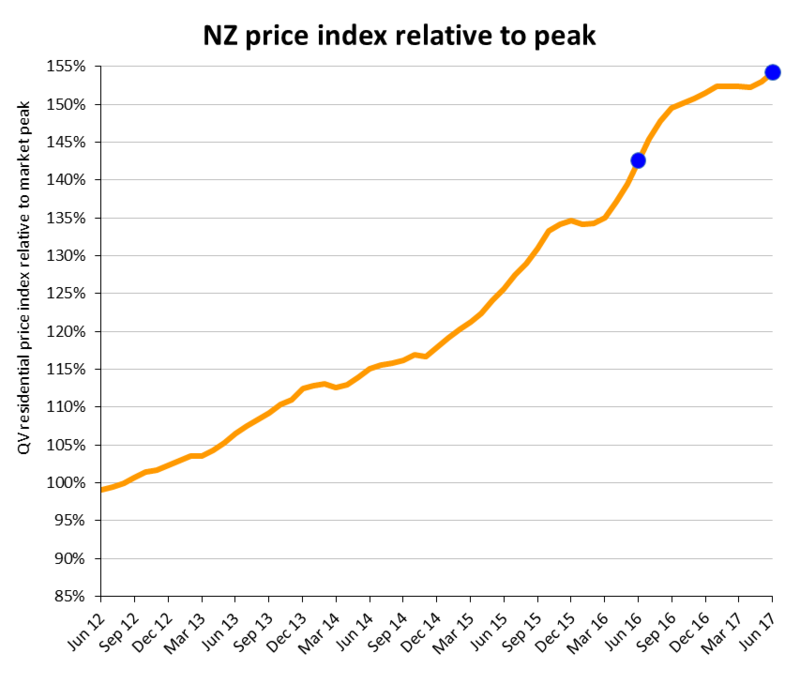 The QV House Price Index shows quarterly value growth in the Wellington region has eased back from previous highs of 5 to 6% a quarter to 2.4% over the past three months. Values were up 18.0% in the year since June 2016 and are now 33.8% higher than in the previous peak of 2007. The average value across the wider region is now $609,552. The Kapiti Coast District once again saw the highest quarterly value growth rising 5.3% over the past three months; followed by Wellington City’s Western suburbs where values rose 4.3% over the same period. Meanwhile, values dipped slightly by 0.4% in Porirua in the three months since April. Christchurch City values remain flat rising just 1.1 % in the year since June 2016 and they decreased slightly by 0.1% over the past three months. Values in the city are now 30.8% higher than the previous peak of 2007. “Listings levels are higher and homes are taking longer to sell in the market currently. “It appears there is less optimism and confidence in where values are going in the market currently and it’s not only taking longer to sell property here but it’s also harder to buy with banks being stricter with their lending criteria." Dunedin home values are continuing the upward trend seen over the past 18 months and the market is seemingly unaffected by recent LVR restrictions or stricter lending criteria that is effecting sales volumes in other parts of the country. Home values in the city rose 14.6% in the year since June 2016 and 3.2% over the past three months and values are now 31.1% above the previous peak of 2007. The average value in the city is now $375,371. Nelson home values rose 15.6% year on year and 1.9% over the past three months. The average value in the city is now $532,120. Meanwhile values in the Tasman District have risen 17.3% year on year and 4.4% over the past three months and are 33.3% higher than in the previous peak of 2007. The average value in the district is now $535,118. QV homevalue Hawkes Bay, Registered Valuer Michelle Drinkrow said, “We are still seeing demand outstripping supply in the Hawkes Bay market with a lack of listings and vacant land and while the market is less frenzied than it was it’s still buoyant. “We continue to see high numbers of out of town buyers particularly Aucklanders selling up and moving to the area in search of a better lifestyle and better bang for their buck. Values increased in all provincial areas of the North Island over the past year and there were only a handful of areas to see a decrease over the past three months. These included parts of Auckland; the Wairoa District near Gisborne where values dropped 7.8% and are still 35.8% lower than the previous peak of 2007; and South Taranaki district where values dropped by 1.0% over the past three months but rose 4.8% year on year. Meanwhile, rose more strongly in many provincial areas than the main centres. This includes in the Kaipara District north of Auckland where values jumped 10.5% over the past three months and 24.3% year on year. And in the Wairarapa which is continuing to benefit from a flow-on effect of recent price hikes in the Wellington Region. Masterton values jumped 23.3% year on year and 5.0% over the past three months; Carterton was also up 24.0% year on year and 4.2% over the past three months; and the South Wairarapa District up 25.5% year on year and 6.3% over the past quarter. In the South Island most areas saw values rise over the past year with the exception of parts of Christchurch East and Banks Peninsula, as well as Ashburton and Buller and Grey Districts on the Westcoast all of which saw values drop in the year to June. The Westland District however bucked this trend with values there rising 5.3% over the past three months and 15.6% year on year. The Waitaki District also saw values jump 6.7% over the past three months and they rose 17.0% year on year. And values in Southland rose 2.2% over the past three months and 17.1% year on year which is the strongest growth seen in this area for some time.